Fender Jazz bass made in the USA during the year 2000. S/N Z0157148. I hate to see this instrument go away but need to cut back on the number of basses in the collection. Instrument upgraded with a Hipshot chrome plated brass bridge (over $100) and new Marcus Miller Fat Beam strings. Bass rates in 9+ condition for a 10-year-old bass. Finish scuffed off on small area on top of head stock and minor signs of use. Used in a non-smoking environment. New thru-body strings installed, instrument set up and intonation performed by David King a well known bass luthier and custom bass builder in Portland, OR. See: http://www.kingbass.com/ Easy to play with fast and low action. All passive electronics – no batteries! Rosewood fretboard. No fret wear. Neck straight as an arrow. Clean and tight sounding. MSRP: $2000 Street: $1400 Used: $750 firm. This bass has treated me very well. She’s been around a little while and shows signs of normal wear, ie: small dents in the head stock, light surface scratches on the back. but she looks fine from a couple feet away and plays great. made in mexico, comes with gigbag. looking to trade for a 5 string. Not too picky on brands. 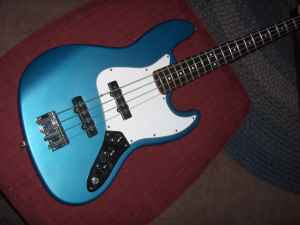 Ibanez is not my first choice, but any offers will be considered. 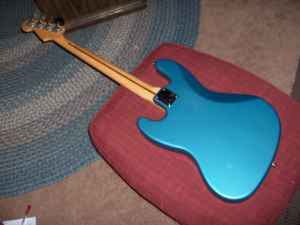 FenderLake Blue Fender Jazz BassTrade This Jazz Bass For ? MIM Black Fender Jazz Bass, Excellent condition, Gig bag, Great tone , New strings.